When using MoGraph in Cinema4D, the effectors can be used for several things other than affecting the position, rotation or scale. Another option is to control the visibility of clones. If you switch to the Parameter tab of an appropriate effector, scroll down and you will see an innocent little check box labeled Visibility. Now you won’t find this on all the effectors as it just wouldn’t make sense on some of them. On the effectors where you can use it however, this check box . . . believe it or not . . . makes clones visible or invisible! You can use this to simply control which clones are visible and which are not. Of course you can use the Falloff to control this too. I’m made a small example scene that demonstrates this using the Random, Shader and Step Effectors. Although the Step Effector is only really using Falloff as it’s control. Here’s a preview of the result. You can download this example scene here. What about the plain effector? I can never get that to work with visibility. Sometimes it feels like I almost have my head around how fall-off, weight, and mograph in general work, but also that there’s a big fat brick wall between my head and enlightenment, and I’m constantly bashing my head against it! 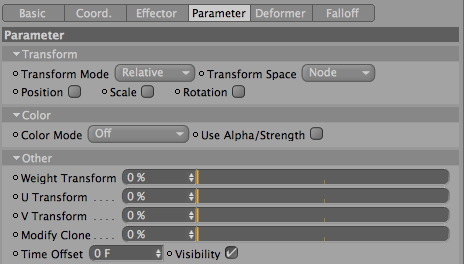 To use the Plain Effector with visibility, switch to the Effector Tab and then fold down the Min/Max parameters. Set the Maximum to 0% and the Minimum to 100%. It should now work with visibility. Per-Anders, one of the genius Maxon programmers behind the MoGraph Module, gave me this explanation of why it is like this. Hope that helps. Thanks Per for the helpful explanation! No wonder I’d never got it to work. Thanks Tim and Per! You make crazy stuff, MLG, FXphd, and now this blog, with amaizing tips. I have a problem with cinema 4d, that sure you have a solution for it. Here I go; I try to render hair with global ilumination, but I always get a black surface, without light or texture, only pure black. Do you know how can i fix that without make extra lights? I render the scene with sun light. I’m trying to make a clone invisible. I’ve attached a null to the clone I want removed and a Plain Effector is attached to that, so I am able to make it invisible during part of the animation, but sometimes it re-appears or causes other clones to disappear. How can I make a clone invisible using just xpresso? Just came across your website today… you’ve done some beautiful stuff. This tutorial was exactly what i needed, to make clones invisble. However, is there a way to make them slowly fade instead of just popping out of existence? Would that require more advanced programming? You could probably acheive this using the MoGraph colour shader in the transparency channel and then driving this with an effector and falloff. This is what i was searching for, but it seems i’m too stupid to apply the information to my current issue. Basically the letters are at a 90 degree angle (showing the backside of each letter to the camera), then the plane effector moves through the text, and rotates each letter 90 degrees to the camera. I am trying to get it to work to not only rotate but also fade in, and having each letter at Alpha=0 before it is rotated by 90 degrees. I am using mograph text and a plane effector with rotation which gives me the desired text rotating in effect, but i cant get the transparency to work. I tried using the color mode but i dont seem to understand what i need to do to link this up to the alpha. enabling visibility does nothing and changing the min/max values also has no effect. i am sure i am missing a small thing, maybe you can give me a tip what to do? Is this doable with mograph only or does something like this require scriptwork? i expected it to be more complex, so thats fine. Thanks Tim, awesomely useful tidbit in that. I was wondering if you knew of a way to use two random effectors on a cloner object? Basically what I want to be able to do is use a random effector to control the visibility of a cloner object separately to another random effector that is controlling random scale/position. @Ben You can apply two random effectors to the same cloner no problem at all. Set one to control visibility and one to control position & rotation. Duh.. thanks Tim. Don’t know why that didn’t work for me initially but its solved all my problems. does this not work on text objects or am i missing something? Hello, could you please help me find a solution for making half of one object invisible. Basically, i have a sphere pol. obj. which i have added to a fracture object to be able to add a step effector to it, with visibility checked. Thank you for all the knowledge you share with us! @wizobrat You can do this with a texture. Either use a gradient or the Normal Direction shader (you’ll need to invert it) placed in the alpha channel of the material. Thank you so much for this quick reply! Should this work if the sphere is rotating? I’m trying this right away. If you use a 3D gradient in camera space, or a simple Fresnel gradient in the Alpha channel it will work on a rotating object. This seems to be more complicated than i thought it would be. Can i somehow send you a project, so you can take a look. How can i show gratitude and repay for your time and effort to explain this to me? Try this file, it’s a 3D gradient (camera space) in the alpha. Sorry I don’t have the time to look at individual files, hopefully this will help. Yes!That’s it. Problem solved. Thanks!!! You need to animate the paper unfolding so you have keyframes on your object. You can then drop it into a cloner (or fracture) and use a plain effector to scale the object and also drive the keyframe animation. I will have a new free tutorial released soon which covers driving animation with effectors and will show you the basic principle. Thank you very much for the tip on the Plain effector! How can i make each clone editable without loosing the visibility effect? Is it possible cache the visibility of clones somehow? You could use Xpresso to iterate through the clones and pass the visibility onto individual objects, google ‘baking mograph with xpresso’ and there are a few solutions online which could easily be adapted to help you out. Hi MTrippe, If you invert the Volume Effector’s Min & Max values under the Effector Tab then it will invert the visibility. Thank you for this response! It helped me a ton today! I literally searched the internet for several hours to find this solution. You just saved my sanity! One question…is there a way to always keep the anchor clone always on? So, if I have a linear clone with a count of “3” and using the random effector, I would only want objects 2 and 3 to randomly become visible and invisible, but object 1 would always be visible.